Fortunately for me, “Kingsman: The Secret Service” had zero shades of grey and a high regard for the proper manners of a gentleman. However, I think a good knight means something different in each movie. 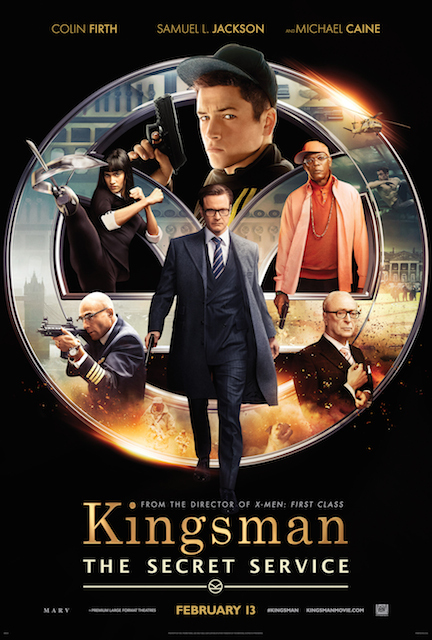 Harry Hart (Colin Firth from “Magic in the Moonlight“) belongs to a secret order of spy types called Kingsmen. They are the modern knights with a rectangle table and when one of them goes down, each knight chooses a candidate to replace him. Harry’s choice is Eggsy (Taron Egerton from “Testament of Youth“), whose father died years ago while saving Harry’s life. Competing against the other 11 candidates for the only job available shows Eggsy has the raw materials for the position but he may lack the killer instinct to follow every command directive. The bad guy here is Richmond Valentine (Samuel Jackson from “Old Boy“), who wants to save the world by thinning the herd a bit. This character has a cadre of conflicting character traits, but the most evil thing about him is his lisp. I understand this came from a comic book, or graphic novel, or what I used to call the funny papers. The team of Matthew Vaughn and Jane Goldman (“X-Men: First Class”) excels at this kind of thing where style and shock win out over substance and sophistication. They know how to make a fun movie with quirky characters and hopefully one day they can elevate the art form. I know what genre we are in, and I suspended my disbelief at the ten-dollar a bag popcorn stand. To see Eggsy go from a timid mischievous kid to dead aim killer and the sole hope for the planet with the confidence of Conan the Barbarian in less than a week without Yoda is crazy. On top of that, spoiler alert: Luke Skywalker shows up. I did like this movie and it is a good romp. The mix of stiff “brits” in this genre is worth the price of admission. They also went to a lot of work to set up a video game where you actually save a princess, and for that I must give this movie 3 ½ stars out of 5. You will have to see the movie to see what Eggsy does with the princess after he saves her.